Scarpetta is the restaurant of Food Network's talented chef Scott Conant. Hidden in the hotel of the Montage and located right across from the very popular Bouchon, the eatery is my Italian foodie fantasy dream come true. The décor is sophisticated and the food is on point. Literally, everything on the menu looked phenomenal. I wanted to order each dish and savor each dish. 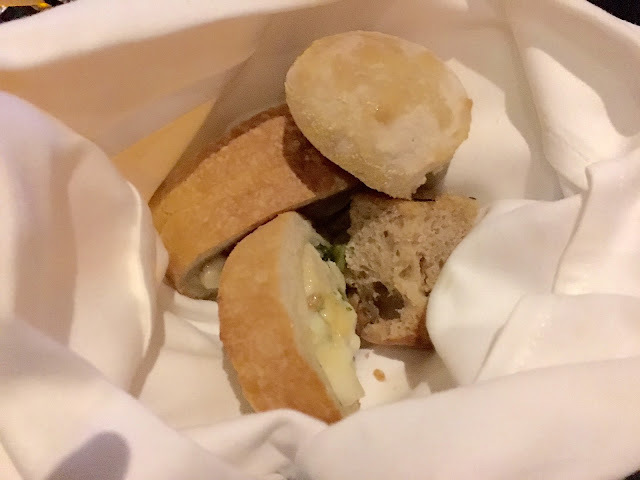 Conant brings simple dishes and turns it into something extraordinary; even the bread was exceptional! The amazing house-made bread! I could eat this all day! 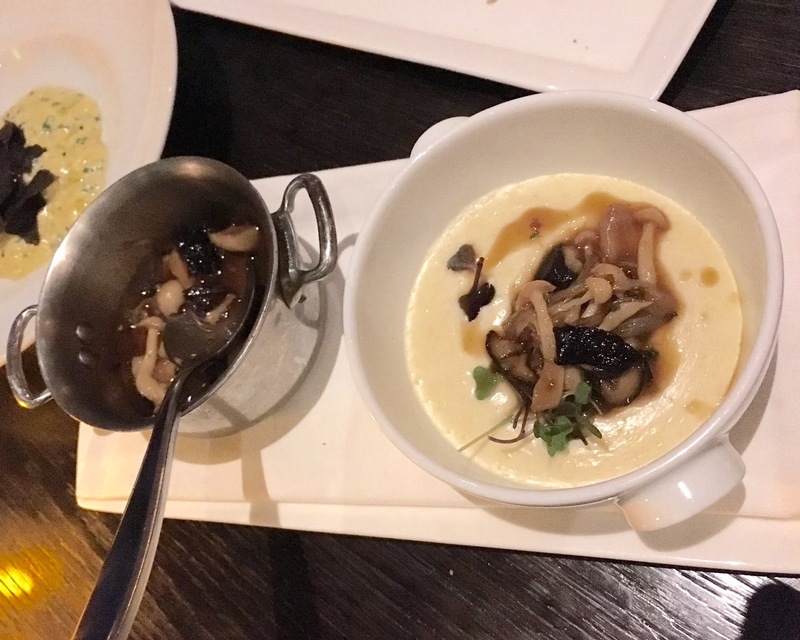 CREAMY POLENTA ($18.00): Fricassee of truffled mushrooms. I never imagined polenta could taste so good. I've had polenta at various places and this is by far my favorite. 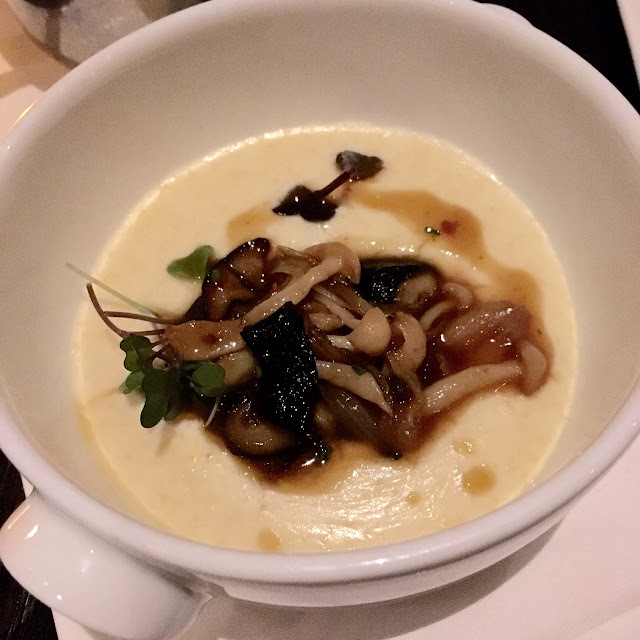 The polenta was super creamy and the mushrooms gave an earthy, richness that made this a decadent appetizer. I basically could eat this for breakfast, lunch and dinner. YELLOWFIN TUNA CRUDO ($19.00): Santa Barbara sea urchin and crispy sunchokes. This was probably my least favorite dish. 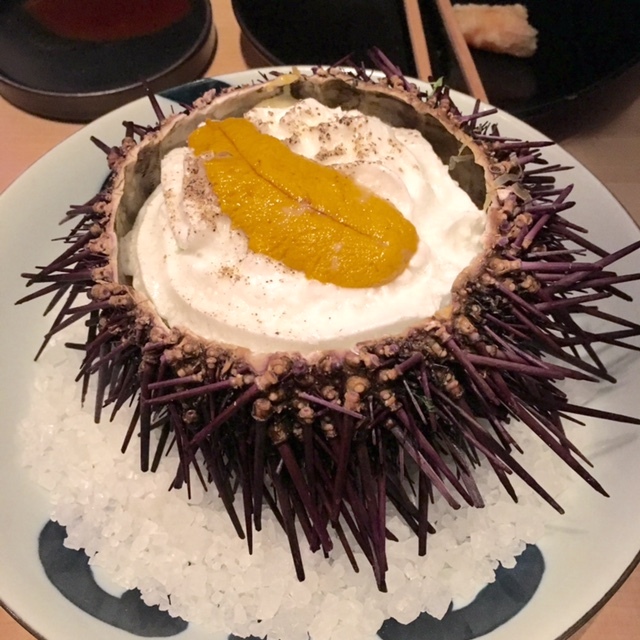 It actually wasn't bursting with flavor as I had hoped nor could I taste the sea urchin. I felt it lacked acidity that the dish desperately needed. The tuna was fresh but I could have probably done without this dish. TRUFFLED SOFT SCRAMBLED MIKE AND SON'S HEN EGG ($30.00): Black Winter Truffles and Toasted Brioche. This is probably one of the most creamiest egg dishes I've had in awhile. The eggs were perfectly cooked and the black truffles went well with the eggs. If I could have breakfast like this every morning, I'd be in heaven! MY FAVORITE DISH. 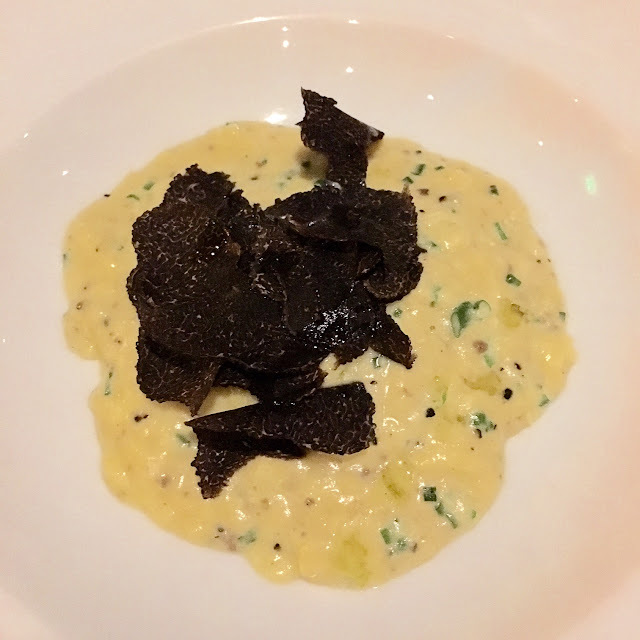 TAJARIN ($65.00): Parmigiano and Winter Black Truffles. Um, I don't know what else to say other than that this dish is utterly amazing. The pasta was impeccable, the sauce was simple with delicate flavors and the truffles added the depth it so needed. I was in complete awe with this dish. 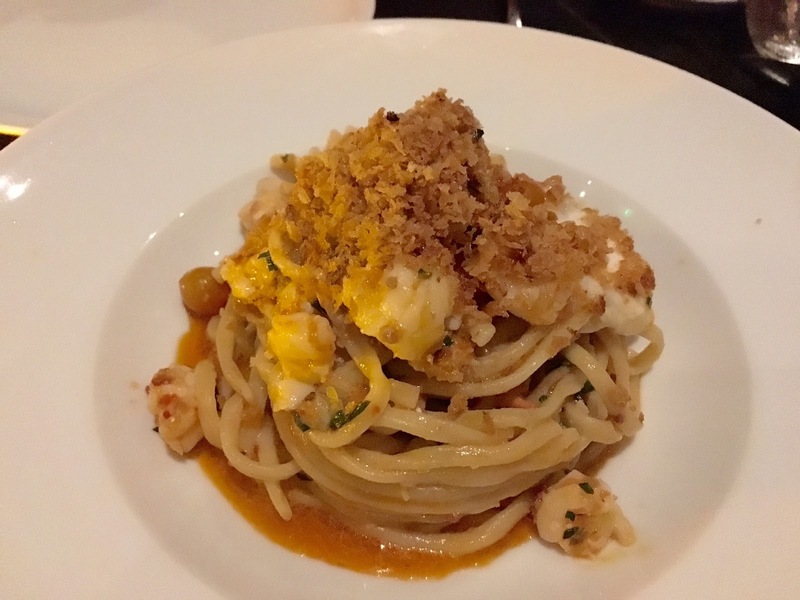 BUCATINI ($41.00): Maine Lobster, Calabrian Chili, Burrata, and Toasted Bread Crumbs. This dish reminded me of Asian style noodles. There was a burst of flavor and the chili added a nice heat to the pasta. The pasta was al dente and the lobster was sweet and succulent. It's like the Vietnamese garlic noodles with lobster but Italian style. I thought it was delicious. SPAGHETTI ($24.00): Tomato and Basil. Who would've thought a simple dish like spaghetti could taste this amazing? This is one of Conant's signature dishes and I can see why: the noodles were al dente, the tomatoes were fresh and the flavors were so profound. This is seriously one of my favorite dishes here and I loved every bite. 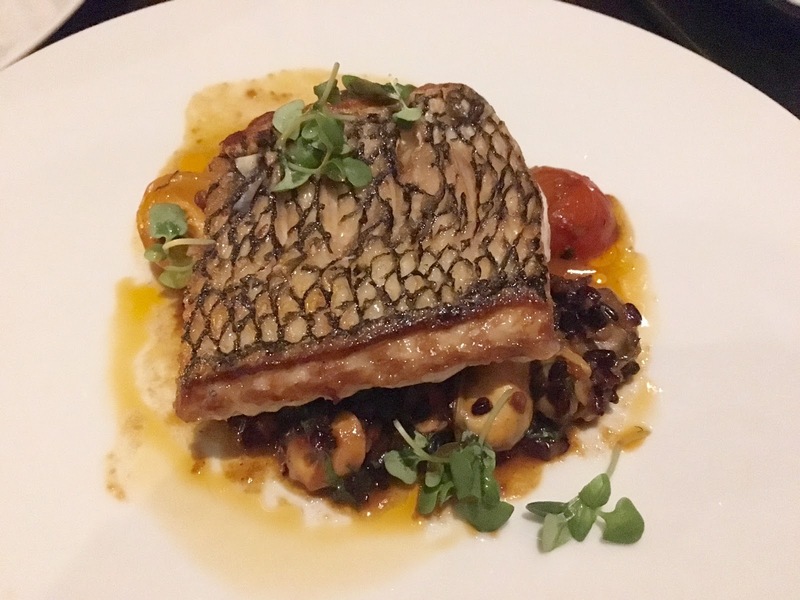 CRISPY BASS ($46.00): Venetian Black Rice, Saffron, Frutti di Mare, and Cherry Tomatoes. This fish was delicious. It had a crispy outer skin layer and the fish was flaky. The flavors were fresh and light and was a good accompaniment to the pasta dishes. APPLE GLAZED DOUBLE CUT BERKSHIRE PORK CHOP ($55.00): Celery Root Puree, Brussel Sprouts, and Finger Noodles. This is one of the best pork dishes I ever had. 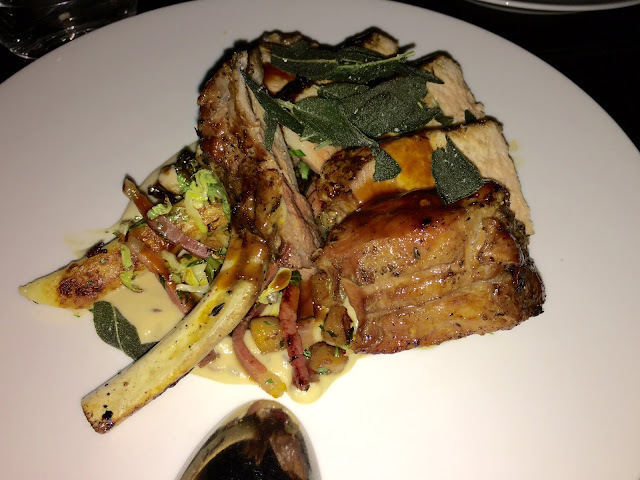 Berkshire pork is one of the best and Scarpetta managed to cook the pork to a perfect medium. The root puree was nice and smooth and the brussel sprouts were spot on. I didn't care for the finger noodles too much as I felt the pork already shined standing alone. 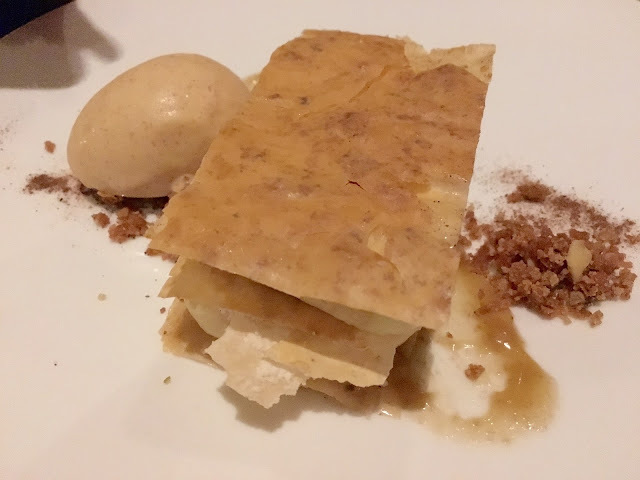 BANANA NAPOLEAN ($12.00): Walnut Filo, Brown Butter Toffee Sauce, and Caramelized Banana Gelato. This was my least favorite dessert out of the three. The components went well together and it was constructed beautifully, but the flavor just didn't do it for me. Rather than tasting caramelized, it almost tasted burnt. If you like bananas, this may be a favorite of yours. 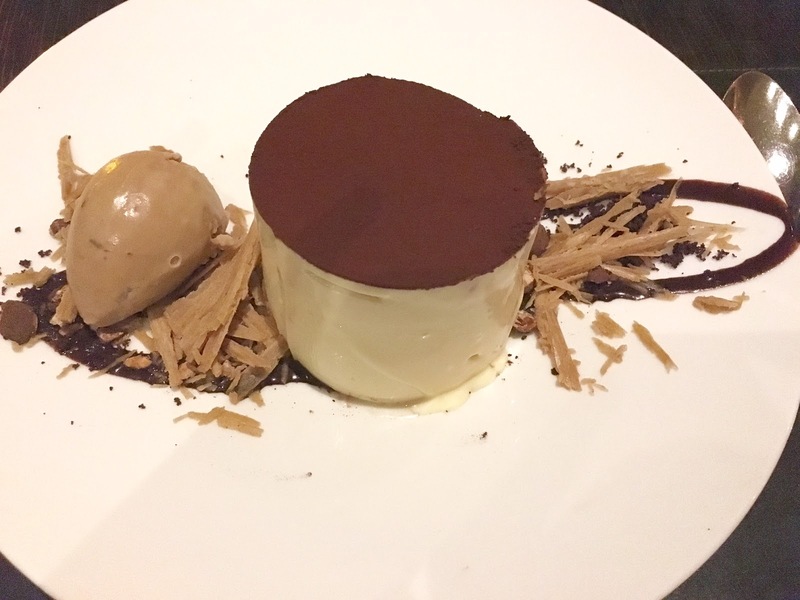 The taste of the banana was definitely prominent in this dessert. TIRAMISU ($12.00): Cocoa, Hazelnut and Coffee Gelato. This dessert was sooooo good. The tiramisu glistened to the point where I thought there was an outer plastic wrapped around the tiramisu only to find it was a beautiful gele coating. The tiramisu was light and airy. The gelato was delicious and was an ideal combination to the tiramisu. PANNA COTTA ($12.00): Caramelized Pineapple, Coconut Sorbet, and Guava "Soup." OMG! The dessert that least appealed to me ended up being my FAVORITE DESSERT of the night. 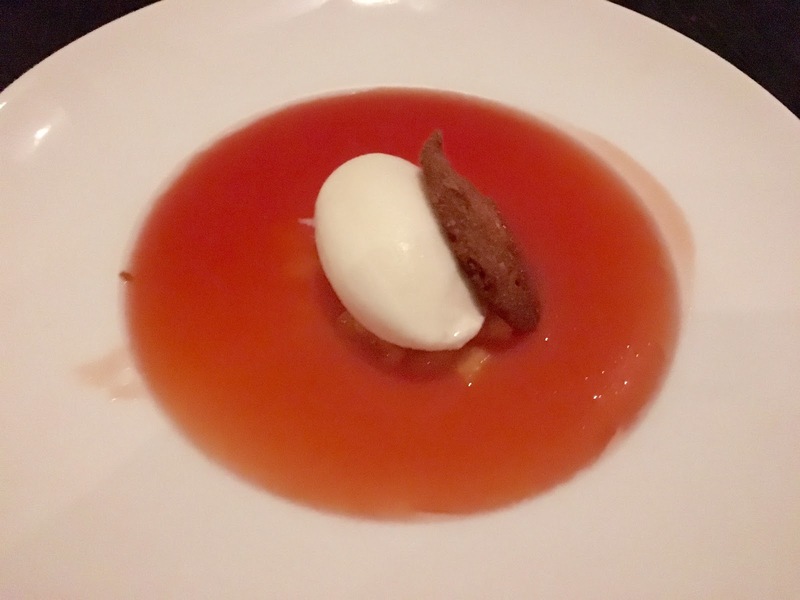 The panna cotta was smooth, the coconut sorbet was refreshing and the guava soup was delicately unique. I loved every bite and I wanted it all to myself. I literally will go back here just for this one dessert. It was refreshing, not overly complicated and a perfect way to end our meal. 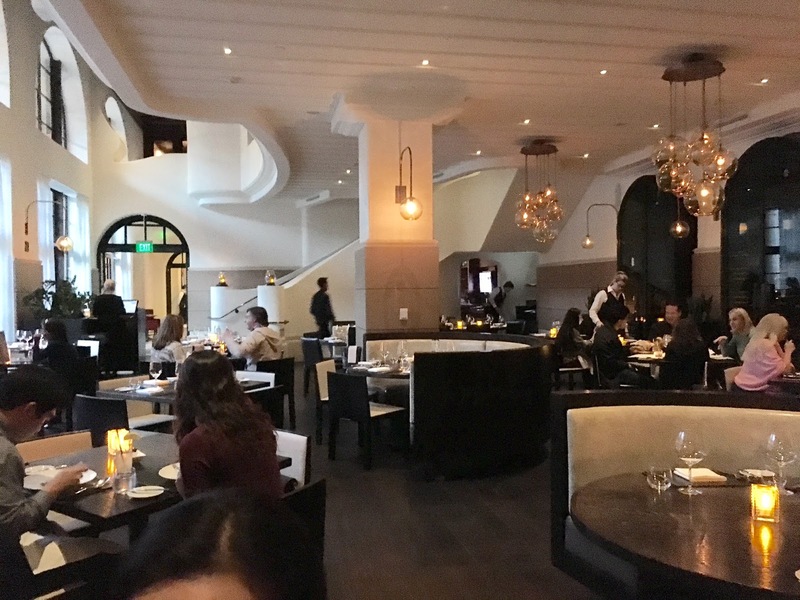 Overall, I would say Scarpetta is ranked as one of my favorite Italian restaurants in Los Angeles. Almost everything we ordered was flavorful, simple, and truly balanced. I'm quite disappointed that its doors are closing April 2. Word on the street is that the other Food Network star Geoffrey Zakarian will be doing the restaurant switch. If it's anything remotely like Scott Conant's Scarpetta, I'll be a very happy piglet. Who would've thought a Japanese restaurant nestled in a small corner of a strip mall could be a gem in the heart of West Los Angeles? 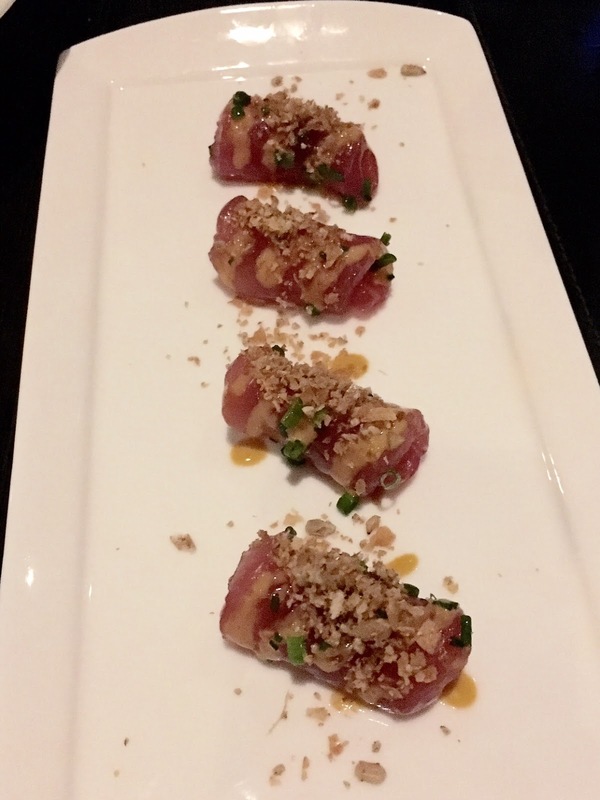 The restaurant boasts a cuisine that incorporates Japanese food with a hint of California flair. Hamasaku, which means "one who creates food from the sea" offers a wide range of traditional Japanese sushi and sashimi all the way to small plates of their own creations. The interior is modern and simple with clean lines. The restaurant is not at all pretentious. You can sit at the sushi bar surrounding the chefs who create the delectable eats or opt for a table. 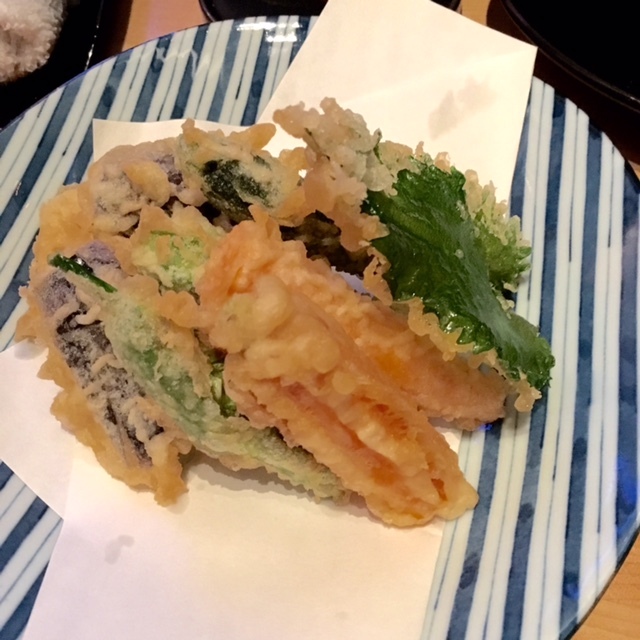 TEMPURA ($14.00): Battered and fried market vegetables, jumbo shrimp. Sometimes I absolutely crave tempura. The delicate vegetables are deep fried to perfection. They were super crispy, not caked in batter and not drenched in grease. I definitely thought these were definitely one of the better tempura vegetable dishes I have eaten. 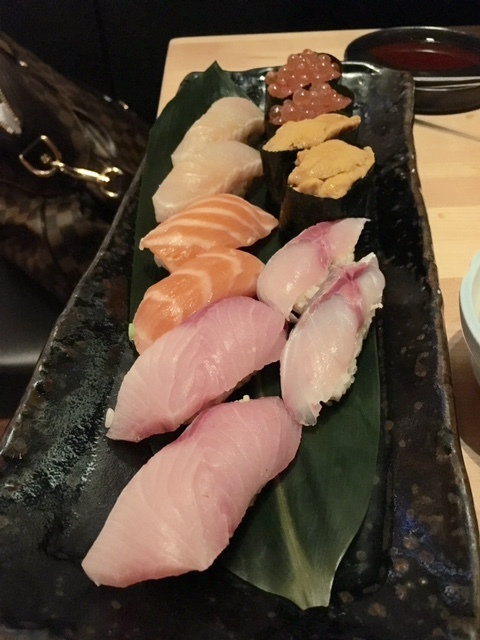 NIGIRI: TORO ($18.00), SALMON ($7.00), SEA URCHIN ($12.00), YELLOWTAIL ($8.00), SALMON ROE ($8.00), SPANISH MACKERAL (VARIOUS). The sushi was pretty fresh. My favorite is the salmon nigiri and it was pretty delicious. The uni wasn't as fresh as I was hoping, but I still ate it regardless. Overall, they have a decent selection of sushi. MY FAVORITE DISH. UNI UDON CARBONARA ($20.00): This dish was so good with a beautiful presentation. The udon sits below a beautiful sauce consisting of egg whites and uni. The noodles were perfectly cooked and the sauce was seasoned well. Mix it together and you have yourself a delicious bite. Oh, they only serve this at dinner and you gotta call to make sure they have it. It'll be devastating if you didn't try it. Overall, Hamasaku is good and a favorable option from eating the traditional sushi if you're craving variety. There wasn't a thing I didn't like. I even ordered two other dishes that didn't make it to the blog cause I was starving and scarfed it down before I could take the pic. The parking lot is somewhat cramped and they do valet. In terms of the tables, they are a tad small if you order a lot of food like we did; however, they try to stagger the dishes. Would I try it again? Most definitely, especially since it's located near my work. Dangerous I say!